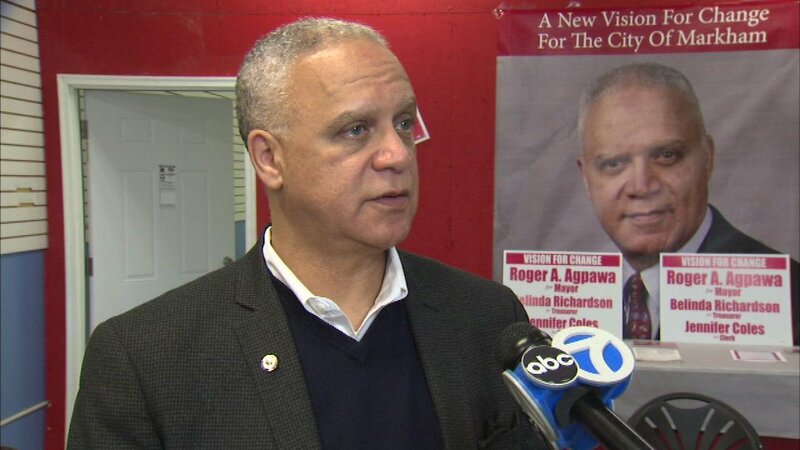 MARKHAM, Ill. (WLS) -- If Roger Agpawa wins the race for mayor in suburban Markham, the Cook County State's Attorney's Office said it will file a lawsuit to have him removed. Back in 1999 Agpawa pleaded guilty to mail fraud. The State's Attorney said under Illinois law that means he cannot take municipal office. It sent a letter to Agpawa giving him until the end of the month to provide proof he has applied or received a presidential pardon for his conviction. Agpawa told ABC 7 he is not dropping out. He said it is his "constitutional right to run" for office. Agpawa doesn't deny his prior felony conviction. He said he was sentenced to three years' probation, ordered to pay thousands of dollars in restitution and perform community service. "That was 20 years ago and I made a bad choice. I will say to that, most of us do make bad choices," Agpawa said. Agpawa is currently the fire chief in nearby Country Club Hills. He said that even with his criminal record, he can run and run serve as mayor in Markham. "From my legal experts, my counsel, they have indicated that I can run and I can be elected and it would be to the city council to swear me in," Agpawa said. According to the State Board of Elections, a convicted felon is not eligible to be sworn in for a municipal office. But state law doesn't stop them from running. On Friday, the Cook Co. State's Attorney's Office sent out a press release about seeking a resolution in the race dispute.